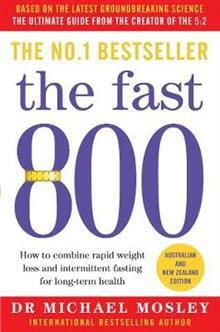 THE ULTIMATE GUIDE TO FASTING, WEIGHT LOSS AND LONG-TERM GOODHEALTH THE CULMINATION OF DR MOSLEY'S BESTSELLING DIETING TRILOGYFEATURES REVELATORY NEW SCIENCE WITH A HIGHER 800-CALORIE LIMIT Five years ago with The Fast Diet, Dr Michael Mosley started a health revolution, telling ... read full description below. THE ULTIMATE GUIDE TO FASTING, WEIGHT LOSS AND LONG-TERM GOODHEALTH THE CULMINATION OF DR MOSLEY'S BESTSELLING DIETING TRILOGYFEATURES REVELATORY NEW SCIENCE WITH A HIGHER 800-CALORIE LIMIT Five years ago with The Fast Diet, Dr Michael Mosley started a health revolution, telling the world about the incredible power of intermittent fasting. Since then, science has told us a whole lot more, and in The Fast 800 he brings you the ultimate guide to fasting, weight loss and long-term good health, and the magic number of calories: 800. If you are one of the millions of followers of The Fast Diet, or have seen the power of The 8-Week Blood Sugar Diet in preventing and reversing type 2 diabetes, then you will know what fasting can do for your health. In The Fast 800, Michael consolidates all the new science - drawing on both the astonishing results of Professor Roy Taylor's pioneering DiRECT study at Newcastle University (UK), which proves The Fast 800 methodology, and on Michael's own pool of data and case studies. The result is an easy-to-follow new programme built around a more manageable 800-calorie Fasting Day - whether that's 800 calories every day until you achieve your goals, or 800 calories twice a week. Working with his personal rationale that he always proves his plans work, Michael puts on 10% of his body weight - about 8kg - then demonstrates how quickly he can shed it using The Fast 800. In his own `Supersize Me' experiment, he documents what the extra weight does to his blood pressure, cholesterol, blood sugar levels, hunger hormones, gut bacteria - and how his overall health improves drastically.